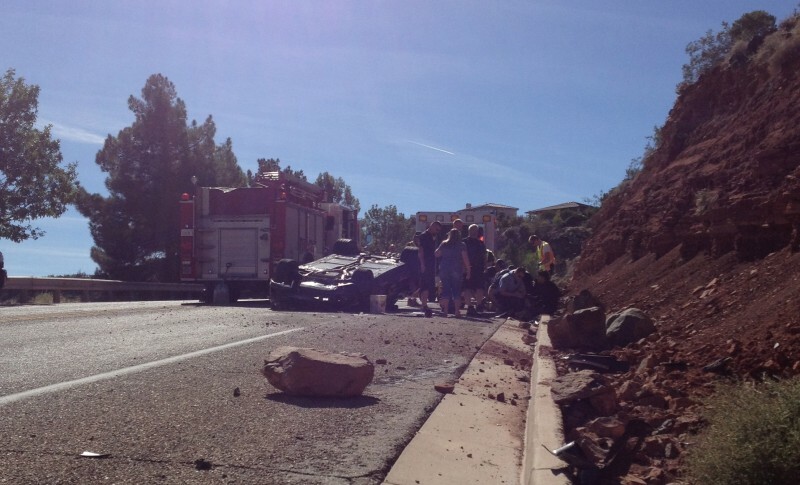 ST. GEORGE – A vehicle rollover on Airport Road in St. George resulted in an hour-long road closure and a transport to the hospital Saturday afternoon. Sgt. 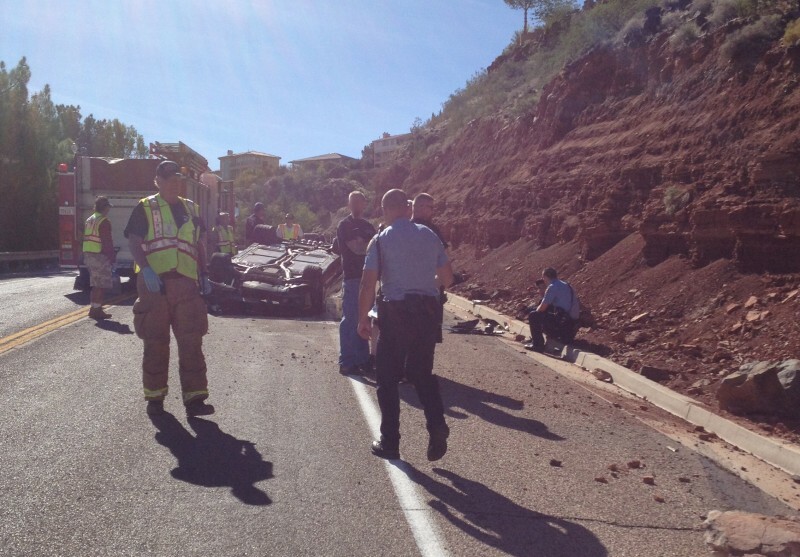 Scott Lemmon of the St. George Police Department said officers responded to a rollover on the hillside portion of Airport Road around 1:15 p.m. Saturday. He said a 21-year-old male driving a black corvette had been speeding down Airport Road and attempted a U-turn. The action spun the vehicle around and flipped it into the opposite lane. Police closed the road for about an hour following the accident. The driver was uninjured but the passenger, a 19-year-old female, was transported to Dixie Regional Medical Center with minor injuries. Lemmon said the driver was cited for driving too fast for road conditions and making an illegal U-turn. The driver had borrowed the Corvette from a friend attending the Dixie Dragz drag racing competition at the old airport grounds, Lemmon said. The city needs to rename that road OLD Airport Road since we have another Airport Road at the new regional airport. Talk about confusion! glad everyone is ok! why rename roads? I wasn’t confused and that really has nothing to do with the crash. I think his attempt at impressing his passenger was a complete failure. Hope his friend had full covergae. We were driving down the hill, PULLED over, came to a COMPLETE stop, then proceeded to make a UTURN. He hit the gas (Like anyone else would do for incline for that hill) BUT this car had twin turbos and has a 5 sec lag and when the turbo kicked in we lost control, after that is a complete blank to me idk how we flipped…..
Oh my hell, excuse me for being old! As a long time Corvette owner, you have to know your car. The newer ones like the Z06/ZR1 are especially quick and requires full attention and knowledge of the cars handling.. Corvette does recommend to have professional training with these quicker cars and never under estimate the power that is produced by these cars. Suggest to running these cars on a track. Cars can be replaced but people and their bodies not as easy..